Through interacting directly with readers of the blog and members of Facebook Groups I am associated with, I had the chance to discuss the three blogging sites. 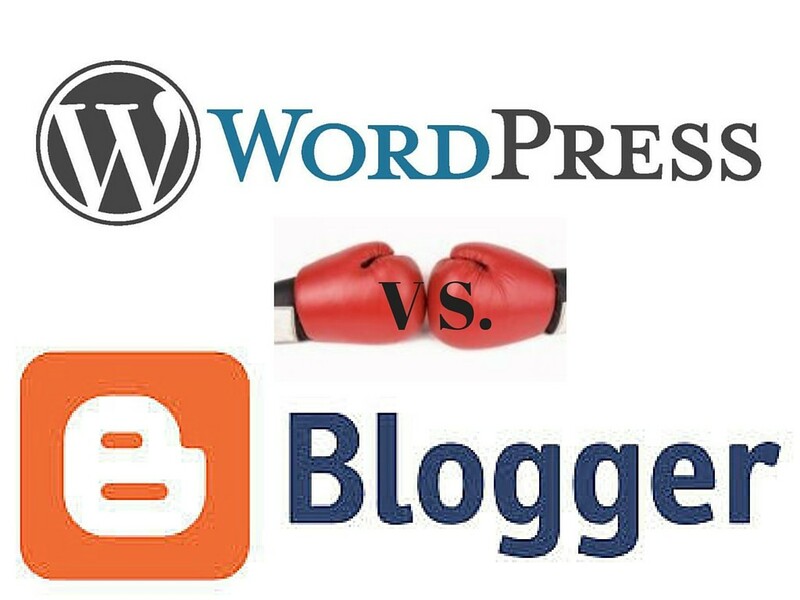 Many readers seems to not know the difference between the three blogging platforms. WordPress.com is “hosted.” Automatic, the company that created WordPress, allows you to open a free account (just like how you can open a free email account with Yahoo or Gmail). Linked to that account, you create a site that is your blog. Your URL will be something like “myname.wordpress.com”. Blogger is quite similar to the WordPress.com option. It is also a hosted option, although it is owned by Google . In this case, the URL would be something like “myname.blogspot.com“. However, I recommend considering other possibilities for your blog, like WordPress.com. Further down you will see why. In short, the closure policy of Google services causes a lot of problems for bloggers. Therefore, a blog on Blogger seems to me to have some major risks. With this “self-hosted” (your own server) option, the platform changes radically. In this case, it no longer is necessary to open an account on Automatic. You are in charge of your own blog, but you have to download the application and install WordPress on your own web server. With this option, you have to choose a domain, install the software on your hosting and do a little maintenance work (approve updates of WordPress, plugins, etc.). As you can see, with the WordPress.org option, there is a lot of extra work on the back end. But you gain several advantages that are light years ahead of the previous two options. And in WordPress.org you can download the WordPress application to install and run it yourself with your own hosting. The application used in both cases is the same WordPress application. But the way you use it is quite different and has many implications. Basically, with WordPress.com, you have access to the software but your options are more limited than with wordpress.org. For example, you are not allowed to use certain plugins on WordPress.com. This is because many more plugin conflict will occur and that would mean more work for the support personnel of Automattic. In a Freemium business model, Automattic aims to make money with paid services that enhance the free version. However, they have been generous enough to offer the WordPress application as open and free software , with all its source code. So the version you get is the software without all the perks. Comparatively, WordPress.org is infinitely more powerful for the reasons already discussed, but it carries some investment in time for installation and training. You need to learn to install and maintain it. In return you have a professional platform that is independent, because with WordPress.org anything you can imagine is technically possible. What is the difference between WordPress.com and Blogger? After discussing the big differences between WordPress.com and WordPress.org , it’s easy to question the differences between the two hosted options, Blogger and WordPress.com. They are hosted by their respective companies. The free option implies that the domain is owned by the company (blogspot.com or wordpress.com). Both allow bloggers to use their own domains, but owning your own domain involves paying. Both have limited space for files, images , etc. They have a designer templates and you can modify the layout, fonts, and colors of your blog without knowing anything about code HTML or CSS . If you know how to program, you can even add pieces of code for advanced customization. It allows monetization via AdSense . It allows use of Google Analytics . Shows no ads for unwanted third parties. Maximum 20 static pages (through unlimited number of posts). WordPress.org is often more complicated than WordPress.com if you want to use your own code to make modifications. For example, free design templates are lost if you use any custom code. They do not have a forwarding service like WordPress.com. You are learning to use a tool whose interface has nothing to do with WordPress.org. If you migrate to WordPress.org, assume that what you’ve started is lost and you have to start from scratch. There is no “self-hosted” platform (WordPress.org) equivalent to Blogger without limitations. The learning curve is much easier than WordPress.org, especially for people with little technical knowledge. You create your account, choose a topic, learn some basics, like the difference between a post and a page, and start writing. Starting a project with WordPress.com is really fast (like Blogger). It facilitates migration to WordPress.org and offers the Redirect Site service that keeps Google rankings stable, even with a different domain structure and URLs in the blog. This guarantees that, upon redirecting your site, you will not lose everything if the positioning of migrated URLs contained in the new blog are changed. WordPress provides payment services to eliminate some of its limitations. All knowledge you learn in WordPress.org WordPress.com re-uses it, the two platforms are handled exactly the same. You cannot use plugins (to extend it or adapt it to specific needs of the blogger) and it has a very limited number of plugins ( approximately 200). Nor does it have design options like Blogger templates. It does not allow monetization via AdSense or any other platform. You are not allowed to use Google Analytics. In short, you cannot say any one platform is “better” than another. In itself, WordPress is not “better” than Blogger, or Blogger “better” than WordPress or WordPress.org “better” than WordPress.com or Blogger. Take a look at our WordPress courses if you want to improve your skills with WordPress. The possibilities with WordPress.org are light years ahead of both WordPress.com and Blogger. But also there is a need for greater initial training to apply and use the concepts such as hosting and installation. Furthermore, certain services come “standard” such as managing email subscribers in Blogger and WordPress.com. In WordPress.org, plugins must be installed for those features. For a beginner who just wants to try blogging, Blogger or WordPress.com are probably the most reasonable. If we add the risk factor involved with using the services of Google, I personally would not open my blog in Blogger. If you are a beginner, WordPress.com can be a good choice. But if you want or need to create a blog that is a little more sophisticated, you want to promote it as a platform for your business, and you need it to function beyond just creating posts (ex: selling products and services or even add a complete online store), that can only be done with WordPress.org. Therefore, make an initial effort to start training with a professional platform from the beginning. If in doubt, keep in mind that migration from WordPress.com to WordPress.org is reasonably affordable, so if you decide to start with WordPress.com, you can avoid some big obstacles. Looks like I am staying with Blogger for now! I love word press. I have so much flexibility! I was always curious at what the difference was. Thanks for sharing! I was getting a lot of questions on this topic. Glad I cleared some things up for you. Personally, I find WP much easier to use and navigate than Blogger. The things is if you want making money better use wordpress. I believe that WordPress is the better option. However, that is just my opinion. Great roundup! I started with Blogger and was successful with monetizing on that platform for several years, but now that I’m on self hosted WordPress, I wouldn’t go back! I will be honest, I love Blogger but I am moving to WordPress because of the owning my site factor. I actually had to do alot of coding with blogger, it is sort of a diy thing with them. This is very helpful. I’m glad I started with WordPress as I’ve heard the difficulties of migrating from Blogger. Great information, Brian! Great distinctions here! Thanks for sharing! Thank you for sharing this useful information! Your post really helped me understand the pro’s to each site, since I’m still new to the blogging community. I currently use wordpress.com to write, which seems to work for me… but now I know my options better for the future. very informative blog! i tried to brainstorm on this for quite some time but it seems that i cant leave my blogger blog to make a new one because it is 10 years old now. i will try to have a wordpress on my photography blog. Thank you so much for this! I am currently with wordpress.com and have been contemplating my next upgrade. These information are certainly helpful. Very informative! But I wonder. Your disadvantages of Blogger seems more like disadvantage to WordPress.